We love vintage pianos. We love the latest in technology. And we love the color red. So what happens if you mix all these components together? Likely, you will get the Nord Stage piano. Rather than offering thousands of sounds (as do many current synths), Clavia narrows the spectrum by focusing on fewer, high quality, sounds in three different categories – piano, organ, and synth. The Nord Stage offers great renditions of acoustic pianos, Rhodes pianos, Wurlitzers (like the 200a model), and organs modeled on the likes of Hammond, Vox, and Farfisa. The synth engine was a special treat, and it supplied a surprisingly warm tone. Live performance is what the Stage series is about, and the Stage 76 is designed to easily incorporate into your rig as a master controller, featuring easy implementation of splits and layers that mix and match internal sounds with your outboard equipment. The Nord Stage also has a great effects section, and a handy USB port to upload new sounds into the Stage 76’s flash memory – if you prefer a different piano sound than what’s onboard, you can download alternates from the Clavia website! Though certainly not the least expensive keyboard on the market, for what the Nord Stage is designed to do, it does it all very, very well. It’s certainly a winning combination of sound and functionality. We are always wary of anything that tries to be everything, as it is rare that all things are done equally well. Well, fear no more! Clavia has packed a great deal of features into this red beast, and much attention has been spent on the fine details and nuances of each instrument. In fact, the musicality of the Stage 76 is what really stands out when playing it. And that, friends, is what endeared people to the originals in the first place. The keyboard itself comes in three models. 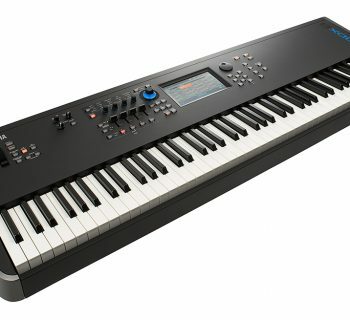 The Stage Compact is a seventy-three key non-weighted version, while the Stage 76 and Stage 88 have seventy-six and eighty-eight weighted keys respectively. All keyboards are otherwise identical in their feature sets. Our Stage 76 was a reasonable-weight, thirty-six pound model running operating system version 2.14. Besides being able to split the keyboard into three zones, a nice design element was the use of twelve LEDs along the top edge of the keys to show where the zones are located. Another great feature of the seventy-six key version of the Nord Stage are its fully weighted keys. Many manufacturers reserve weighted keys only for their eighty-eight key keyboards; Clavia has placed the same fully weighted keys found on the eighty-eight key version on its seventy-six key offering. This is a welcome feature, and we wish more companies would do this – most eighty-eights are just too heavy for local gigging purposes, but the Stage 76 is just right. Of course, it also includes Clavia’s signature roughly textured aluminum mod wheel and maple-handled Pitch Stick, an innovative and expressive pitch bender/controller. The Stage 76’s control panel is divided into sections: Master (volume and rotor effects), Program (select/store sounds, activate splits/zones, system parameters), Piano, Organ, Synth, Effects (including amp modeling), and Extern (for use as a Master controller). The Nord Stage organizes sounds into Programs, which contain all settings (which instruments are in use, which effects, etc). A program can contain one instrument or a combination of six! The Nord Stage memory is arranged into twenty-one Program pages, with each page holding six programs, for a total of 126 programs. Programs also include settings for what is called “Panel A and B.” By this, we mean that each instrument section is two-part multi-timbral, and therefore can produce two sounds simultaneously with completely independent settings. This feature allows you to alternate between two sound setups within a single program, or allows layering of two full panel sounds by activating the Dual Panel mode. The piano section contains six button-selectable categories: grand, upright, electric grand, electric piano, Wurlizer, and Clavinet. Included sampled instruments are: Yamaha C7 Concert Grand, Steinway Concert Model D, Svenska Pianofabriken (a Swedish Piano, designed to sound like a parlor piano), Yamaha M5J, Yamaha CP-80, Rhodes Mark I, II, and V Stage pianos, Wurlizer 200a, and Hohner D6 Clavinet. If this isn’t enough for you, Clavia’s website provides additional sampled pianos you can download, and the keyboard comes with sound editing/management software right out of the box that works on both Macs and PCs. Cool. A nice feature is the set of Clav EQ buttons, which allow one to emulate all the different settings of the original Clavinet’s pickups, which can alter the sound quite a bit. The organ section feature three classic organs: a Hammond B3, a Vox Continental II (V-type), and a Farfisa Compact Deluxe (F-type). The model you want to play is simply chosen by pressing a button. Like other Clavia instruments, there are no actual mechanical drawbars. Instead, the drawbars are represented by buttons and LEDs that display exactly where the settings are. While a little skeptical at first, we found this system actually quite responsive and easy to use. Percussion, key click, and vibrato/chorus settings are all represented and editable. 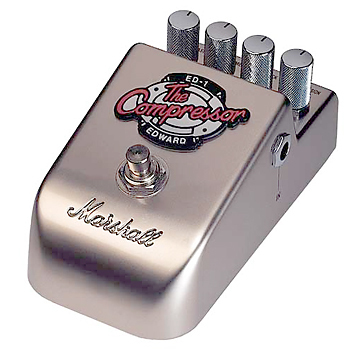 Other features include swell control, which is accomplished by attaching a standard expression pedal to the provided input jack. The rotary speaker section (a.k.a., Leslie speaker simulation) is located next to the organ section, but actually, it can be used as an effect on any sound, including piano and synth sounds. Finally, by activating the split organ setup, this enables you to create an upper and lower manual, whose settings are controlled by the Panel A and Panel B settings. A pleasant surprise to show up on the Stage 76 was the synth section. No, it is not a full Nord Lead synth engine, but rather a versatile synth capable of a wide range of useful sounds. The synth section uses subtractive synthesis, FM synthesis, and wavetable synthesis. There are controls for oscillator settings, velocity, mod envelope, wave selector (analog/digital/FM), filter (lowpass with resonance), and voices (monophonic/polyphonic). Sounds are divided into three categories: synth, pad, and bass, with ninety-nine memory slots in each category, for a total of 297 sounds. This section can be divided into three main categories: Panel effects (effect one instrument/panel at a time, therefore two sets of Panel effects for each program), Global effects (effect all instruments), and the Rotor effects. Effects include ring modulator, tremolo, Pan, two Wahs, Autowah, two flangers, two phasers, two chorus, and two delays. The amp/eq effects are very cool. The three simulated amps include a Roland Jazz Chorus, the Wurlitzer 200a internal speaker powered by a tube amp, and a Fender Twin tube amp. These are all classic amps used with vintage keyboards, and much of the classic instruments’ sounds have been defined by the amps they were played through. This inclusion was wise, and definitely adds life to the already-great sounds. The rotor section allows one to control the speed and overdrive of the equivalent Leslie speaker settings. This section can be controlled by a foot pedal as well, just like the real thing. Master effects include reverb (five types) and a compressor. The amount may also be adjusted, rather than just simply On or Off. This section allows easy-to-setup control over other keyboards when using the Stage 76 as a master controller. Once the section is activated, the external instrument (i.e., synth or synth module) will respond to the Stage 76 as if it were an internal sound! In this fashion, for example, one could easily and quickly set up a split, and use the Extern section to have the external instrument respond only to the zone it was assigned to. External instrument volume and program changes can also be assigned in this section. This function allows single or multiple parameters to be controlled by the mod wheel, a connected control pedal, or aftertouch. Parameters include level, timbre, filter frequency, drawbars, effect rate/tempo, effect amount, parameter knob, and rotor speed. At first quick glance, we did think the front panel looked busy, but once we started playing with the keyboard, we found it was very well organized. Sections were clearly labeled, and there were plenty of LED indicators to let us know what was activated. The hammer action keyboard (with aftertouch) is actually designed by Fatar, so if you like the the feel of Fatar’s keyboards, you will be right at home with Clavia’s. We thought the keyboard had a solid, comfortable feel, and didn’t have any gripes about it. One observation, however, is that on a dark stage, seeing all the printed words above various buttons and knobs may be hard to read. Once you are familiar with where everything is, this probably won’t be a big deal, but until then, more illumination might be helpful to some. Along those same lines, a larger LCD screen would have been welcomed as well. Alas, a small 16 x 2 is all you get! The included editor software is very useful in this regard, but again, for a live setting, a larger screen is always a nice feature. Sometimes, size really does matter! Having said that, operation was actually quite simple. Turn a knob, press a button, and play! The knobs and buttons all had good tactile feedback, and there were very clear and appropriate changes in sound when a parameter was modified. The manner in which the Stage 76 implements electronic organ drawbars was actually easy and fun to use. And, unlike real drawbars, we could save the settings to get our perfect sound every time. Using eight pairs of very sensitive Up/Down buttons, the electronic drawbars were effectively able to change the sound in real-time, just like the real thing. The synth section was also surprisingly easy to operate. Oscillator and filter controls (both buttons and knobs) are present, and the keyboard was very responsive in real-time to manipulating the sound envelope. One cool feature – the parameter you are adjusting visually changes in real time. For example, say you have aftertouch assigned to the feedback effect. As you press into the keyboard (aftertouch) and start invoking the assigned effect (in our case, feedback) not only do you hear the sound change exactly as you are controlling it, but the LED indicators on the front panel change and adjust to highlight where you are controlling them. In this way, you can visualize exactly what you are doing. Cool! We decided to set up some splits both between the Nord Stage’s internal sounds and with and external module. To create the internal split between an organ sound and a piano sound, all we had to do was press the KB Zone Select buttons in each corresponding section (in our case, Organ and Piano). At first, both sounds were heard throughout the entire keyboard; the sounds at this point were simply layered. Pressing the KB Zones 2 button split the keyboard into an upper and lower zone, which was nicely displayed by a green LED at the split point key of the keyboard. To assign the organ sound to the lower keyboard zone only, we simply pressed and held down the Shift button and pressed KB Zone Select in the organ section until the “LO KB ZONE” indicator was lit (the other choices included “Up” for two-zone splits and “Hi” for three-zone splits). If one wanted to then assign the piano sound to the upper half in our example, just hold down Shift and then the KB Zone Select button in the piano section until the “Up/Hi” indicators are lit. That’s it! As much as we like the Nord’s sounds, we also like our other equipment, and one staple in our studio is a venerable (and fully-expanded) E-mu Vintage Pro module. We wanted to create a split using the E-mu module and the Nord keyboard. This took a minute to figure out at first, but was actually fairly simple, too. To use an external keyboard, all we had to do was press Shift and the Dual KB button. The “Panel B” part of the program was now referencing the external keyboard/module. There are dedicated buttons in the “extern” section on the Nord Stage that now functioned as if you were touching the external sound source. Splits were set up the same way as before (Shift button and KB Zone Select), and the usual menu of choices (program select, volume, octave shift, MIDI control change) were also represented as dedicated buttons. Once we performed these tasks a few times, we really appreciated the simplicity of this interface for creating splits and layers. With many other keyboards of ours, these tasks required navigating countless menus and submenus. With the Nord Stage, just a few button presses and we were up and running. It is always nice to see new features in a product, but “standard” features that are improved upon over other products always welcome. Finally, the Nord Stage comes with a red USB cord (cool! 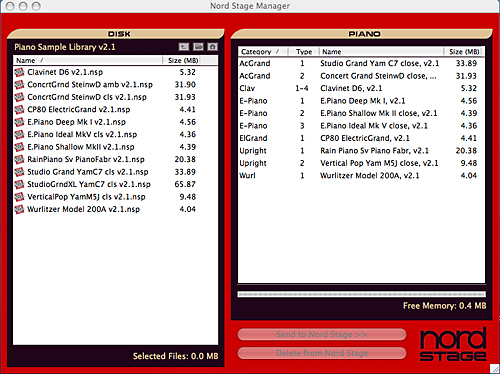 ), and a CD that has the documentation as PDF files and the useful Nord Stage Manager application. 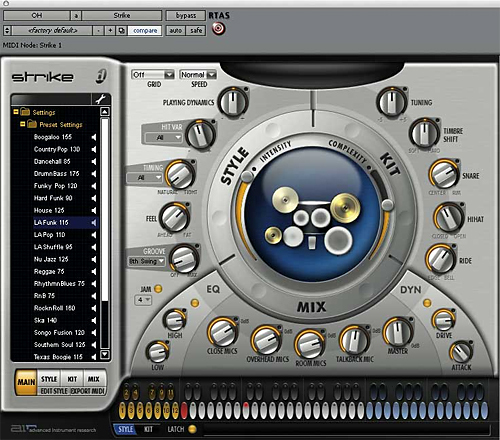 This program, compatible with both Macintosh and Windows, allows the manipulation of both the sound samples and sound programs. Installation was quick, and after connecting the USB cord to our Apple PowerBook, the Nord stage was detected right away. On the left side were the samples available on our hard disk, while the right side listed what was available on the connected Nord Stage. While not a sound editor, we could easily transfer piano samples, and backup and restore programs as SYS-EX files. This was helpful, though it would be great if a future version included some basic sound-editing features, too. We love our vintage keyboards. We own several of them. What we don’t love is transporting them (our Rhodes weighs150 pounds). At thirty-six pounds, the Nord Stage 76 is quite appealing, assuming that the sound lives up to our requirements. Does it deliver? You bet! The acoustic piano sounds were implemented very well, and the upper and lower registers (where many sampled keyboards fail) were particularly good. Being a fan of Genesis and Tony Banks, the CP-80 piano brought a nostalgic smile to our faces as we played “That’s All.” The Rhodes and Clav offerings were also equally good, though some of the sounds we had to play fairly hard to get the bite we wanted. Fortunately, this is a parameter that can be edited to taste. The organs were very good, and there were even some distorted ones reminiscent of Deep Purple. And if you are a fan of The Doors, there are plenty of Vox and Farfisa organs to suit you. Having had some experience with Clavia’s Electro series, we weren’t too surprised that the electromechanical pianos were done well. But what was surprising was the quality of the included synth section. This was also quite good! The Nord Stage is capable of some very warm analog sounds, from pads to leads to swirling, modulated sounds. With a split setup, we were able to have a B3, a Rhodes, and an analog synth lead all at our fingertips – and that’s just using the onboard sounds! Indeed, the synth section is a very solid component of the Stage 76, and while most sounds were above average, some were quite stellar. Personal synth favorites include “sololine,” an aggressive lead synth (think of a more syrupy “The Final Countdown”), “synclead” (which works really well with real-time oscillator tweaking), “flangescrub” (a swirling pad reminiscent of Korg Triton sounds), and “Green Monday” (New Order, anyone?). Incidentally, one of our non-synth personal favorites was the “Crunchy Mark V”, a Rhodes with some overdrive bite, tweaked to perfection with a little tremolo from us. The Stage 76 user’s guide is a well-written manual with [gasp] diagrams! All sections were well explained (such as setting up splits and layers), and button combinations that were needed to access various features were also clearly explained. The Download section on Clavia’s website is also helpful with downloading manuals, new samples, and the latest operating system. The Nord Stage 76 ($3,800 MSRP) sells online for around $3,000. This certainly isn’t a keyboard for those short on cash. Having said that, though, if one thinks about what it would cost to get multiple pieces of pro-level keyboards that do what the Nord Stage 76 does, one could arguably say that you get what you pay for… and that’s a lot! This is a great keyboard just for its outstanding acoustic piano sounds and weighted keyboard alone. Adding great Rhodes, Wurlitzer, and Organ sounds, plus a respectable synth engine and quality effects, make this unique keyboard a worthy addition to any pro keyboard rig, especially for players who love quality vintage sounds.